Google Wave has been one of the most fascinating product from Search Giant. Wave made a lot of buzz and wave in the web. Still Google feels that it could not be adopted by masses. Then was the worse news we got. 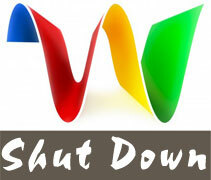 Google has decided to not to continue Google wave, and It'll be shut down at the end of this year. This will definitely break hearts of many wave fans. Is there any hope? Google wave is an innovative real time collaboration & new kind of communication tool, which lets you see typing of letter, sharing images, writing comments, dragging n dropping stuffs and more in real time. On it's first birthday in May this year, Google opened Wave for general public. Till then it was accessed by invitation only. Fortunately some lucky guys like me got invites in the early days of it's launch. I feel that keeping people deprived for about a year, made most of us dislike or neutral about Google Wave. This is the big reason of less user base and adoption. No doubt it is or was one of the most innovative product in all time. Google team says that they got to learn a lot from Google Wave. Though they are not continuing to develop it as a standalone product. They will include the features of wave like dragging and dropping, real time updates and collaboration etc in other products like (as we already see now) in Gmail, Docs etc. Any link to Google ME? There is no doubt that Google is paying more attention in the development of Facebook Killer (or at least big competitor) Google ME. What if all your favorite features were available in Google's New Social Networking Site Google ME? Yes it is really going to happen. Google's twitter like product Buzz and Orkut are already the success. If Google pays more attention towards the privacy control, this is surely going to make a way. Google is known for it's successful products, just think about shutting down of "Google Pages" brought the new "Google Site" with completely new and more advanced features. The same is for Google ME too. I can't hide the excitement. Do you know there exist lots of people around, even the users of rkut, who haven't yet heard of Wave. So Sharing is caring! I am very positive about this step. What do you think? Stay tuned for more updates. Google Going to Shut Down Google Wave at The End of This Year. Thank you Shekhar. This is really heart breaking news for all of us. I am a big Google Wave fan. I was thinking to do a paper presentation in nearby college about Google Wave. But I just heard this news. Several people had a blog, forums based of google wave. Now everything is going to shut down. I think this is one of the biggest failure of Google. yeah...i have lot of faith on google...lets see what google has for us in form of "Google me"
Google loosed it :( This is big failure! What about orkut? It will also close in future? Orkut is considered as Success, but it can't become Facebook however, and it shouldn't be. Because Google ME is coming for that. Why didn't I thought of that before??? We completely forgot Google ME! Thanks for reminding us mate! I think we'll see what Google ME is very soon! I had about 19 invites (10+10-1) but could not give to anyone :( Lucky me, i got invites in the early days.